At Ferry Orthodontics, we believe in treating each of our patients the way we would a family member: with compassion, gentleness, and respect for their unique needs. Ours is a practice where the emphasis is always on you. Your comfort, your goals, and your smile are Dr. Michael Ferry’s and our team members’ top priorities. We offer one-to-one care. Dr. Ferry will see you at each of your visits, to monitor the progress we’re making and check in with you. If you have questions or concerns, please let him know. He’s always available to patients and parents, and you’ll be updated at every visit. We understand that every patient has different needs and we will work to create a customized treatment plan JUST for you. We hold ourselves to the highest standard when it comes to infection control and sterilization. We have interactive Web services which included e-mail and text message reminders, on-line access to your account including balances, insurance payments, progress records and next appointments. Dr. Michael Ferry was trained in laser dentistry and uses a soft tissue laser to enhance aesthetics for our patients. Dr. Ferry regularly attends continuing education classes to stay up-to-date with the rapidly changing field of healthcare. Family member discounts- we appreciate and reward your loyalty. We accept most major insurances such as Delta Dental, Blue Cross Dental, MetLife Dental and GEHA working to maximize your benefit. Two convenient office locations in Cranston and Wakefield. Ferry Orthodontics believes it’s essential to support our patients and our community. We sponsor many local sports teams and feature their plaques on the wall in our reception area. We’re active participants in many fundraising events, as well. Before starting orthodontic care, it’s essential for you to know your treatment options. It’s just as essential to find a practice where you know you’ll receive exceptional care from people you like. We invite you to call and schedule a complimentary orthodontic location at our Cranston or Wakefield, RI offices. 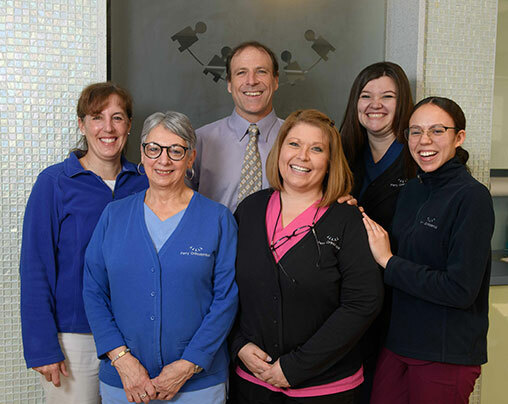 Everyone at Ferry Orthodontics looks forward to welcoming you to our practice. We’d love to get started creating your new smile today!